The mission of the Peck School of the Arts is to provide the highest quality education and professional training in the arts at the baccalaureate and master’s degree levels. The school is committed to recruiting faculty, staff, and students who reflect the richness and diversity of art-making in a variety of cultures. As the only school of the arts in Wisconsin in a major urban environment, the Peck School of the Arts encourages collaboration with community arts organizations and artists to provide professional experiences for its students. The University of Wisconsin Board of Regents approved the creation of the School of Fine Arts at the University of Wisconsin-Milwaukee in December 1962. 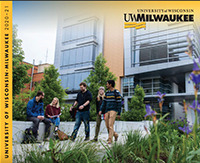 It was the third school created at UWM, joining the College of Letters and Science and the School of Education. As one of the pioneering schools in the newly created University of Wisconsin-Milwaukee, this new academic unit, comprised of departments of art, music, dance, and theatre, became a center for the creative and performing arts in a city that lacked such a nucleus. In 1974 a department of film was added to provide a full complement of arts training and programming. The UWM Art Museum was created in 1982 to consolidate exhibition support and gallery space for the Art Department. In 1996 the museum’s name was changed to Inova (Institute of Visual Arts). Today Inova is one of the world’s top venues for contemporary art. In 1999 the school was renamed the Peck School of the Arts in recognition of the generosity of the Milton and Lillian Peck Foundation in supporting and sustaining the school’s many programs. In 2000 the school acquired the temple across the street from campus, formerly the home of Congregation Emanu-El B’ne Jeshurun, and renamed it the Helene Zelazo Center for the Performing Arts in recognition of the lead donation for the acquisition made by the Nathaniel K. Zelazo Revocable Trust. The Helene Zelazo Center for the Performing Arts is one of the premier performance venues in the greater Milwaukee area. It is home to the Helen Bader Concert Hall and the Peck School of the Arts Department of Music and its many ensembles. Today the Peck School of the Arts offers twenty undergraduate and graduate degree programs serving more than 2,100 student majors, making it one of the largest and most comprehensive arts schools in the region. The Peck School is a vital home for the arts, presenting more than 350 events each year. For a comprehensive history of the establishment of the UWM Peck School of the Arts, please refer to A Climate of Creativity by Adolph A. Suppan, Dean Emeritus.